What does a ‘Living Future’ look like? Find out at Abbotsford Convent in Melbourne on 11 October. 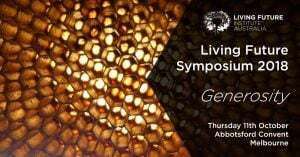 Bringing together inspiring thinkers and doers, the symposium aims to define, redefine, examine and challenge what a ‘Living Future’ could really mean across multiple communities and multiple industries. The individual talents and the collective energy of those who attend are invited to imagine and share new ways of making such a future possible. Symposium attendees will hear stories of people, projects and journeys under this year’s theme: generosity. Key speakers will address topics such as Living Buildings, Biophilic Design, and the Healthy Materials Revolution – and these presentations will be paired with thought-provoking debate and confrontation of issues, via roundtables and panel discussions. For tertiary students, the UnSymposium Sprint will be held a week ahead of the symposium, with teams of students giving their all to respond to a brief for a Living Future. To close off the Sprint, each of the teams will present to all of the attendees at the end of the symposium on the 11th October. The winners will be announced, and teams will receive some career-defining opportunities. For more information, see the Living Future Institute website.